There are few things more cute in the world than a 2 year old speaking Setswana. The kids here grow up speaking Setswana until they start school, where they are expected to learn English. 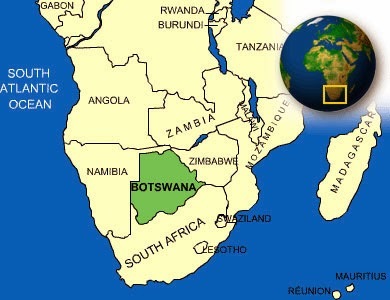 In Botswana, English is mandatory in every school, but often times (especially in smaller villages) English-only is not enforced. Our communication is limited to numerous high fives, fist bumps, and repetitive name-saying. I say 'Game' and she responds 'tee-tee' because the name Christy is practically impossible, then we laugh and make faces at each other. We repeat this roughly 20 times before we're both tired. The word 'ko-ko' is how they say knock knock here, so when you walk up to a door you say it. One time, my friend and I were sitting in my living room and we hear this tiny voice saying 'ko-ko' probably five times before Peggy (host sister/Game's mom) tells us Game is at the door waiting for us to let her in. She also calls my friend Mike, 'Mikey', which no one ever does so she made it up herself and it is hilarious. Anywho, I think I like her so much because she can't speak English. Oh oh oh! Have you seen that YouTube video of the little kid who laughs and then makes a serious face really fast, and then bursts out laughing (it's adorable, look it up)? Ok, well, she does that. I've been trying to get it on video, but taking out a camera here creates the same responds as throwing candy into the air, the kids go freaking NUTS. So technically, I'm not actually a volunteer.....yet. I'm still a trainee, and if I were to leave bots now, I can't say that I have ever been a volunteer. Not until Tuesday! Tuesday is what we in PC world call 'Swearing In' and it is kind of a big deal. PC Botswana makes it a real ceremony full of speakers and food. Some other countries do not do anything celebratory, but our country director is pretty celebration-oriented. It is going to be at a really nice hall in the hospital here. We will each have our name called and everyone's host families will be in attendance cheering us on, then after we will all celebrate the rest of the day as full-fledged PCV's while we sit and tally all the rules we have already broken (.....just kidding). Wednesday though, it gets real. Every site is responsible for providing transportation to our village from Serowe. Mosetse is, I think, roughly four hours north of Serowe? I'm pretty sure I will be riding up with another volunteer who lives even further north than me. We are going to demand to stop in Francistown at a store called Game (actually pronounced like English game), which is the bots equivalent to Walmart. If we aren't able to stop on the way, it's going to be really hard to buy anything big for our houses because trying to fit a huge basin, a large fan, or a table on a bus will be horrible and awkward. Right now, I know that I indeed have a house, which is great because some people have barely heard from their villages and may not even have a house set up yet. If that does happen, they are going to be forced to stay in Serowe another week until it gets sorted out. I also am supposed to have electricity, but they were still working on it, last I heard. All the houses have to be inspected and up to PC security standards, and if they are not, then the pcv will have to stay in Serowe until it is all secure. Crossing my fingers that everything is alright, because I'm really ready to go. I love my host family, but for the love of god I want my own kitchen....and privacy. I'm going to make Rice Krispies later and I almost do not want to because I cannot stand having four kids and often times Peggy surrounding me the whole time. Deep breaths. I have also not only increased my number of starch servings a day from 10 to 15, but I have actually been going out of my way to eat more white bread, they make the best damn rolls. Other than trying to wean off my addiction to bread (I feel like Steph), i'm also really excited to start introducing myself around my village. Some people are replacing a volunteer in their site, so they already have the scoop on the ins and outs of the village. While that definitely has some wonderful perks, it also has its downfalls. If you are replacing someone, you might have some pretty big shoes to fill. The villagers may always be comparing you and may not like it if you do something differently than the previous pcv. I'm basically trying to justify this to myself, because I am the first pcv in Mosetse. People are going to go CRAZY when I move into town. Tea for days! Let's all hope they speak English, for the sake of my sanity. Haha! That's awesome! I've only been to Dukwi once so far. Were you in the refugee camp (or was that even there then?!)? Everyone speaks Setswana and English so I'm having a very hard time forcing myself to learn kalanga! I know a few phrases, though. I lived at the CJSS in the village. My students lived in hostels at the refugee camp, and we had sports activities in the camp, so I spent time at the camp, but didn't live there. These days I think the hostels are on the actual school grounds in the village. I was just kidding about Kalanga, although I wish I had become as proficient in it as I was in Setswana. Hopefully you are settling in well!